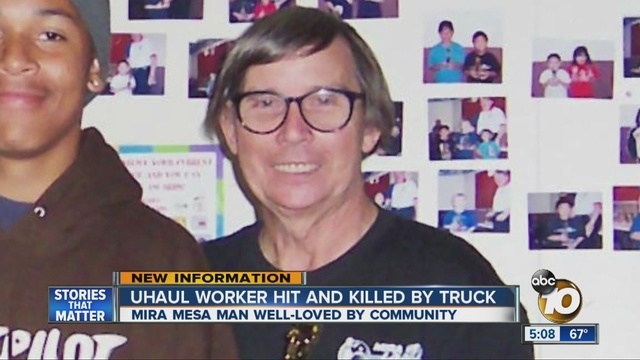 An employee who was fatally run over by a rental truck at a U-Haul business in Mira Mesa was identified Saturday by the San Diego County Medical Examiner’s Office. Alfred White, 80, of San Diego was pronounced dead by firefighters at the scene of the accident at the lot on Camino Ruiz near Miralani Drive at about 6:45 a.m. Thursday, according to officials. White was alone at the time, but a video camera recorded the entire incident. White was shown on the video entering the U-Haul truck and moving it in reverse a short distance. He then opened the door and exited the truck. Moments later he was knocked to the ground by the door of the vehicle and the truck rolled over his body, the ME’s office said. Sometime later, a customer found White lying on the ground and called 911. San Diego Fire Department personnel responded to the scene and confirmed the death due to obvious fatal trauma.